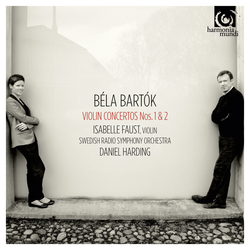 Such is the fame of Bartók’s Second Violin Concerto (1937-38), thanks to its supreme accomplishment, that it has virtually eclipsed the First, written thirty years before! Yet this earlier work, rediscovered long after the composer’s death, has a fascinating story all its own . . . True to her custom, Isabelle Faust has gone back to the multiple musical sources of this First Concerto – a work that came ‘straight from the heart’, since Bartók’s romance with a young violinist lay at the core of its creative process.